Wicker Tortilla Warmer with inner styrofoam - Wickerwork is a flexible plant branch or twig, as of a willow, used in weaving baskets or furniture. The wicker tortilla warmer will keep your corn tortillas or flour made tortillas smoldering hot. They blend perfectly with any kind of kitchen and table, with their wicker fiber and beautiful flower design on the outside and strong insulation on the inside; it will keep your flour made tortillas, bread rolls, pancakes, cookies, pita, empanadas, gorditas, quesadillas, and waffles warmer, soft and ready to eat so you don�t have to get up and warm them. Hand made by Mexican handcrafters, they are known for their strength and durability. No matter the season or where you are the wicker tortilla warmer will keep your Mexican tortillas warm and ready to be eaten. They are the most light weight tortilla warmers, which make them perfectly portable, so you can take it on picnics, school events, outside in your patio for family gatherings and barbecues, at company functions or at the beach. Enjoy along that hot Mexican cuisine of yours and still get those warm, delightful, home-made fresh tortillas or even mission tortillas. 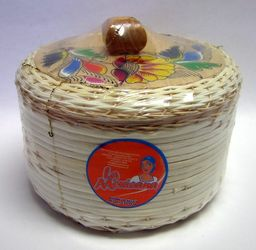 The Wicker tortilla warmer make excellent gift ideas which will delight any and all tortilla lovers in your gift list. It also makes a great addition to Mexican restaurants as an authentic tortilla server, giving your restaurant a nice Mexican touch. Hand Made by Mexican Handcrafters. Keep Tortillas Fresh and Warm for over 1 hr. Holds up as many tortillas as you want. Store easily with no hassle. El Tortillero de Mimbre � El mimbre es una rama de una plata o ramita, como de sauce, usado para tejer canastas o muebles. El tortillero mantendra tus tortillas de maiz o de harina calientitas. Se llevabien con cualquier tipo de cocina, con su fibra de mimbre por fuera junto al bello diseno floral en la tapa y su fuerte aislamiento en el interior, mantendra tus tortillas de harina, panecillos, panqueques, hotcakes, pita, empanadas, gorditas, quesadillas y waffles calientitos y suavecitos listos para comerse para que no tengas que pararte de la mesa a calentarlos. Hecho a mano por artesanos Mexicanos, son conocidos por resistencia y durabilidad. No importa la temporada o donde estes, eltortillero de mimbre mantendra tus tortillas calientitas y listas para comerse. Son los tortilleros mas ligeros de peso, lo que los hace perfectamente portatiles, para que los puedas llevar en picnics, eventos escolares, en el patio de tu casa en reuniones familiares y barbacoas, eventos del trabajo, o en una carne asada en la playa. Dizfruta junto con tu comida Mexicana y obten esas deliciosas tortillas caseras calientitas que tanto te gustan. El tortillero de mimbre tambien es una excelente idea de regalo, que deleitara a cualquier y atodos los amantes de las tortillas en tu lista de regalos. Tambien son una gran adicion a restaurantes Mexicanos como un servidor auntentico de Tortilla, que le dara un toque Mexicano a su negocio. Mantiene las tortillas calientes y frescas por mas de 1 hr. Almacena facilmente y sin problemas. I bought this as a gift for my daughter and son in law. They loved it. They had one that broke and were very happy to get this as a replacement. They use it very often. The quality of the workmanship is very good.